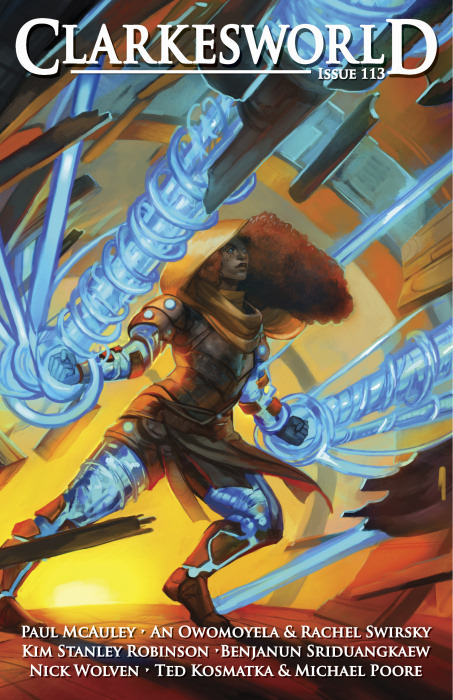 "Between Dragons and Their Wrath," by An Owomoyela [bio] and Rachel Swirsky [bio] (edited by Neil Clarke), appeared in Clarkesworld issue 113, published on February 1, 2016. Pro: Superficially, this is the story of how Domei and Hano decided to leave Ponçan and seek their fortune in the capital. At a deeper level, it seems to be speaking of the horrors that war leaves behind, such as mines and grenades that are still deadly decades later. Hano's decision to let himself be maimed just so he can get support from an NGO is particularly chilling. Con: There's very little real action in the story. Even the attack by the crazy American is played with zero tension. It's hard to make out what the revelation at the end about the two dragons means. Is it saying that Domei actually has the spirit of a dragon? If so, what does that mean? I wasn't sure what to make of this one, so at least I'm not alone. The setting was interesting and I was starting to understand how the dragons worked (both in the narrative and metaphorically) then the story came to a slightly bemusing end. This is one where I keep expecting someone to point out that I missed something really obvious that would have made it all come together and turn it from a 3 to a 4 or a 5. But maybe not this time. Good story, but a bit of a tease for what seems like a really fascinating world.